Ok, so Ekid is 5 and still wets his bed now and then. He has gotten steadily better this year, but last year it was pretty much every…..night…… Ugh! I tried those vinyl fitted sheets but they would just slip off in the middle of the night eventually, or rip. I tried the vinyl sheet that covers the whole mattress and zips up, but that just tore after a about a week, besides the annoying plastic sound…ugh! 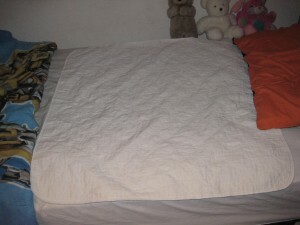 But a month ago or so I found these pads: Invacare Reusable Bedpads This bed pad has worked great! it is pretty much like the ones they have at the hospital. I love that I can just put it right on top of the sheet and Ekid can lay on the pad and it is comfortable and waterproof! 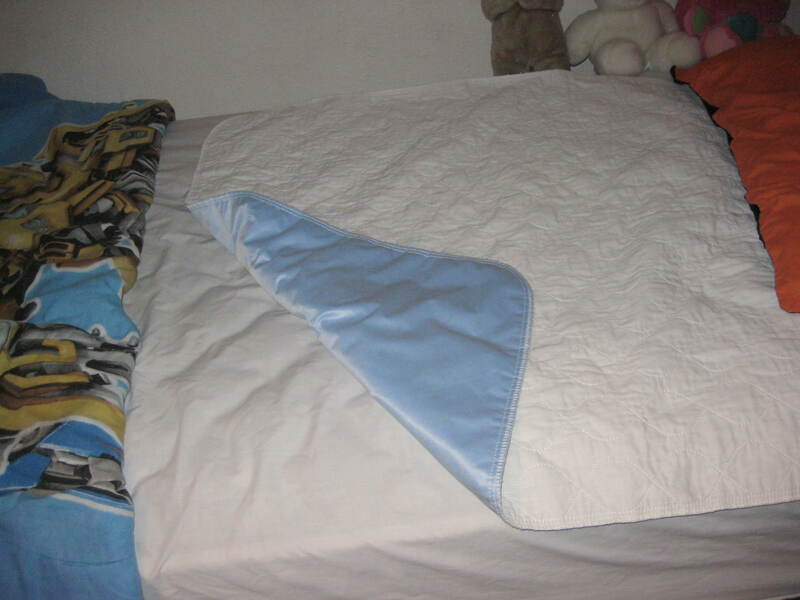 He has had a few accidents on it and it has held up beautifully leaving the mattress and sheet nice and dry and so all I had to do was throw the pad and maybe his blanket, in the wash. 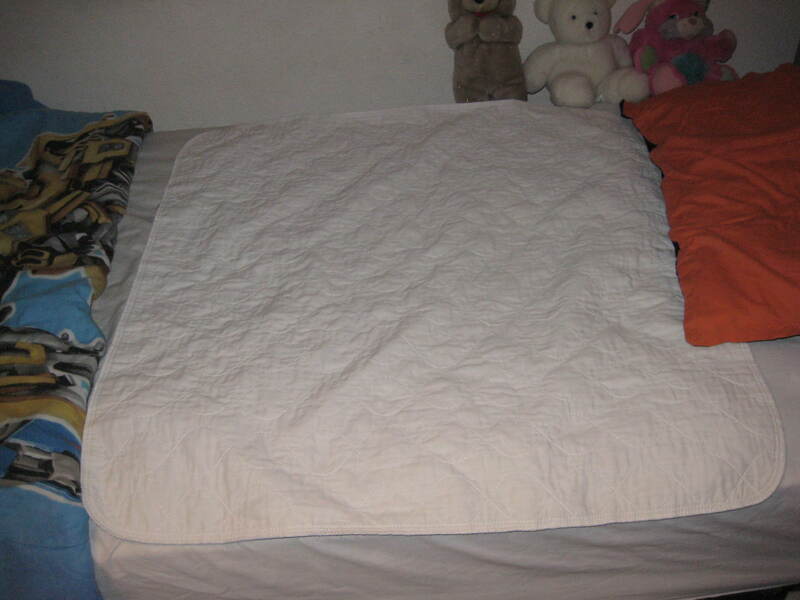 The bed pad has been washed and dried several times now and is still in tact and in great condition. Now I thought at first that it would be better and stay put better if I put it under the sheet, but not so. It actually seems to stay put better on top of the sheet, plus when he wets, he doesn’t get the sheet wet and I don’t have to reach under the sheet to readjust the bed pad. I do readjust it at bed time, but it stays put really well while he’s sleeping, even though he does move around some. If you have a real mover, it might not do as well, but I suppose you could put some velcro or something on the bottom of it maybe? Anyway, I really recommend the Invacare Reusable Bedpads , and yes that link is an Amazon link and I do make a little money if you buy from there, but it really is a great buy as I’ve checked elsewhere but Amazon seemed to have the best price when I bought mine. I ordered this item to save my eight-year-old’s sheets. He sleeps in a loft bed and it is such a pain to change the sheets on a bed that is so high. I thought it might be easier just pulling the pad down and throwing another one up there. I was right! I was worried that it might not be big enough, but if I lay it down longways, it covers most of his twin bed. He is able to spread it out himself while he is up there. And it is very high quality. Much better than I expected! Very durable and I know it will last. I really like it. I have just purchased another actually. it doesn’t slide around at all?